Back to the Chronicles of Narnia I go. So after the unbalanced experience of The Magician's Nephew, there was a lot more for The Lion, the Witch and the Wardrobe to prove for me. Perhaps a little unfair of me, but then it has a big old reputation to support as well. 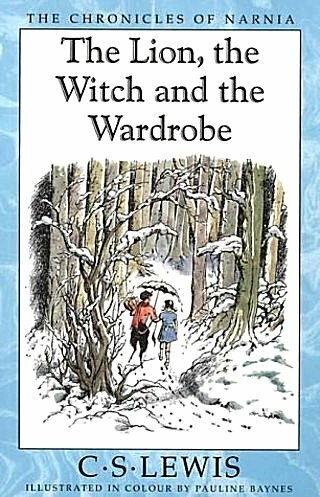 In The Lion, the Witch and the Wardrobe the reader follows a set of four siblings sent to the English countryside as part of the evacuation process during World War 2. Whilst exploring the grand house where they are now living, the youngest child, Lucy, ventures into a seemingly ordinary wardrobe and finds that it leads to the magical world of Narnia. Things are not as they should be though, as Narnia is now stuck in an eternal state where it is always winter and never Christmas, caused by the magic of the White Witch. After Lucy's friend Mr Tumnus is taken away to the White Witch's castle, the siblings are spurred into action against the evil dictator. But there may be complications as Edmund, the younger brother, finds himself tempted to the White Witch's side by promises of power. In comparison to The Magician's Nephew this is a much more balanced affair. While there is still a sense of directness and a real lack of build-up, but it doesn't feel quite so abrupt and out of place here. Additionally, there were no scenes where the quality differed massively from the rest of the book, and the plot overall is just stronger. My main issue is that the characterisation of the siblings is very much on the sparse side. To be honest, the only reason that I could tell Peter and Susan apart was their gender; otherwise they were pretty much indistinguishable in terms of personality. The only one who really stood out was Edmund, if only because initially he was the kind of nasty little bully that really puts me off of the idea of ever having children. I'm also more than a little confused by the fact that Narnia has Christmas, but I think that that is an issue more particular to me and my nitpicking ways.